Welcome to the Shark class page! Here you can find out what the children in Shark class are learning about and when. We will also share any key dates and notices with you. Children are back in school Tuesday 23rd April. When we return, we only have 14 academic days until SATs. We would like to thank all parents for their support with the extra boosters and breakfast cub which we provide in order to boost children’s confidence and academic progress. Children have focused on summarising and will continue to do so after half term within their revision sessions. They will also revise retrieval and inference questions. Please continue to read with your child at home, the more they read, the more vocabulary they are exposed to. The children have worked incredibly hard on their poems this week and have created some amazing poetry using ‘imagine 3’ sentences. After half term, we will be doing revision on grammar, filling gaps in relation to their SATs. This week, we have worked on long multiplication and fractions (equivalent decimals and percentages as well as simplifying fractions). After half term, we will be revising every day in preparation for SATs, enabling children to feel confident and ready to sit those tests! Don’t forget, we only have 14 teaching days left when you come back from your Easter break before SATs. Over the break, we don’t want you to forget all the amazing things you have learnt. For ten days, spend a maximum of 20 minutes on each of the activities. You may decide to be super awesome and do them all at once! This homework must be bought in Tuesday 23rd April. Every child who brings in their completed revision will be selected to take part in a special treat after SATs. Make sure you’re one of those super cool children. Year 6 really enjoyed the ZOOLAB visit last week and a lot of children overcame their fears by holding a snake or a giant cockroach! Well done everyone. We only have 4 academic weeks until SATs. Don’t forget, your child must be practicing their times tables (Pixl and Time Table Rockstars). They must also aim to get quicker as SATs are under timed conditions. Thank you for your continued support as we prepare our children for this crucial time of year 6. Well done to all children who have worked so hard on their diary entries this week. It is so lovely to hear the children say how proud they are of their work. Next week, we will be looking at poetry in relation to the journey the Endurance made from England to South Georgia and into the Weddell Sea. The children have worked fantastically on short and long division; using their skills and applying it to reasoning problems involving division. Next week, children will go over multiplication and other key skills they need to revisit in relation to their recent mock SATs. Children have started to work on summarising and will continue to do this next week. They will have the opportunity to answer questions which require summarising a paragraph or whole text. These are the type of questions children will receive in their SATs papers. We are very excited to have ’ZOOLAB’ visit Northfield next week. The children will be given the opportunity to get up close and personal with real animals. This will take place on Tuesday and, following that, the children will be given the opportunity to write about their experience! Children have worked hard on inference skills and will now be moving onto summary skills. They will have the opportunity to answer questions which require summarising a paragraph or whole text. The children are really getting on board (excuse the pun!) with their writing in relation to being a crew member on ‘The Endurance’. They have been researching what life on board was like. Did you know they called their living quarters ‘The Ritz’? The children will continue to write their diary entries as they focus on key events, such as the time the ship got stuck in ice on the Weddell Sea! Last week, the children worked fantastically on learning the properties of 3D shapes. They have learnt a wide range of mathematical vocabulary to explain a 3D shape and have been learning to produce nets to represent them. This week we will be going over short and long division as this has come up as a weakness in their mock SAT results. Please help your child to learn their spellings. Read with your child at least three times a week, this is very important as it helps your child learn new vocabulary and helps them develop empathy for characters within books. Arithmetic and grammar papers are due Friday 29th March. Well done to all of the year sixes who worked so hard last week in their mock SATs. Please remember to continue reading with your child at home at least three times a week and practise their timetables. Also, children can practise their grammar skills on Pixl Unlock. For English, children will be exploring the character of Ernest Shackleton. They will then be writing a CV and personal statement stating why they would be good as a member of the ‘Endurance’ crew. This week, children will continue their geometry skills and explore: measuring angles; drawing shapes with given angles; drawing 3D shapes and the parts of a circle. In reading comprehension, children are beginning to answer inference questions. They will continue to practise this. They will also continue to do this in timed conditions to best prepare them for SATs and to enable them to complete a reader paper quickly and accurately. Don’t forget your reading comprehension and maths reasoning homework is due Friday 15th March. Welcome back. We hope you had a lovely half term. We would just like to take this opportunity to thank you for all your support so far in the children’s learning. We have had lots of positive feedback from parents about our drive towards SATs and we really do appreciate all the work you put in at home as well with your child. The children are working incredibly hard and are an absolute delight to work with each day. Next week we will be doing mock SATs with the children. This is important for the children so they get used to sitting tests and, when it comes to the real thing in May, it is second nature to them. It also helps us, as teachers, assess their learning so far and for us to continue to identify where any gaps are. There are just 8 school weeks left until SATs week is here! It is vital that your child is in every single day. Once again, we thank you for your support in this. We will be doing maths revision prior to the SATs which will correspond with how we will run SATs week in May. Children will have the chance to apply what they have been taught so far in year 6, to their tests. The SATs do not just test them on the year 6 curriculum but also on what they have learnt throughout key stage 1 and 2. Children have worked hard on their recounts of a journey they have made this week. They have considered key and memorable events and practiced using a range of sentence structures to improve their writing. It is expected that every child attends breakfast club from 8am. There is a variety of food provided included bacon rolls, cereal, fruit and bagels. This is absolutely free of charge and it helps your child prepare for their learning for the day. PE will always be on a Friday afternoon, but there will also be a session earlier in the week which will not always be on the same day. PE kits in school all week please. Year 6 Saturday enrichment is continuing on a Saturday and is open to year 5 students as well. All children are invited to come, we love seeing so many children there. Make sure your child does not miss out! Please make sure you read with you child at least three times a week. Ask them questions about the book they are reading and explore new vocabulary together. Please then record this in their reading record. Children have a reading comprehension and maths reasoning test due back Friday 15th March. We are halfway through the academic year! Children, will be discussing what a protest is and consider the predicament of the varmints. They will also be analyzing the end of the story ‘Varmints’ and discussing whether the end could actually be a beginning. We will be looking at percentages problems in relation to ratio. Children will then be applying their skills to SATs style questions. Following the children’s latest test results, we will be addressing areas of weakness to ensure the children are ready for their SATs. Reading- In reading comprehension, children are beginning to answer inference questions. They will continue to practise this. They will also continue to do this in timed conditions to best prepare them for SATs and to enable them to complete a reader paper quickly and accurately. Topic- Children will continue their science work on classifying living things. All children now have a ‘Times Table Rock Stars’ account. They can still access their Pixl times table app. Please make sure your child practices their times tables regularly on both. English- In reading comprehension, children are beginning to answer inference questions. They will continue to practise this. They will also continue to do this in timed conditions to best prepare them for SATs and to enable them to complete a reader paper quickly and accurately. Writing-Children will look at a balanced argument in depth. Maths- We will be using analysis of recent SATs practice papers to fill gaps. Topic- Children will be classifying plants according to their characteristics. New homework was handed out on Friday (maths arithmetic and grammar papers). This homework is due back Friday 8th February. Please encourage your child to pack their bag the night before so they do not forget things such as PE kits and homework. What a great start to our Spring term. Thank you to all the parents who attended the parent meeting on Thursday. If you were not able to come, please do speak to your child’s teacher to book an appointment. English- Children will be focusing on writing a debate this week: Should the varmints stop thinking and accept the changes as a sign of positive progress? Maths- In mathematics this week, children will be looking at a range of methods for multiplication and division. Reading-For reading comprehension, children will continue to focus on retrieval questions. They will then start to look at inference questions, where they are required to look further into the text for key points to answer the question. Topic- Children will continue to develop their skill in classifying, identifying many ways to classify living things. SATs home learning is due Friday 25th January. PE will always be on a Friday afternoon, but there will also be a session earlier in the week which will not always be on the same day. PE kits in school all week please. Some children are forgetting their kit. Please remind them to get their school things ready the evening before so they practise preparing their school equipment independently, ready for high school. Please make sure you read with your child at least three times week and it is recorded in their reading diary. These are checked every day. We’ve made a great start to the new Spring term. All the children have embraced the new groups and timetable changes made following the assessments they completed at the end of the Autumn term. SATs based homework will now start to come home regularly. Children have a maths reasoning paper and a reading comprehension paper. Both of these are due back Friday 25th January. There are just 4 months until SATs week, so it is vital your child is in school, each day and on time so they do not miss any of their learning. Topic- Children will have a science-based focus and be looking at 'living things and classification'. Reading- For reading comprehension, children will be focusing on retrieval questions. They will be recapping key steps in finding the answer and explain how they can use language within the question to locate what they are looking for in the text. Writing- The children have started a new book called ‘Varmints’ by Helen Ward and Marc Craste. The children have been looking at poetry and how the author can use language to set the mood. Next week, children will be looking at the film Varmints and identifying how language used can paint a picture in the reader’s mind. They will also be writing and performing their own poetry. Maths- In mathematics this week we will focus on addition and subtraction methods. Additionally, we will be looking at word problems and reasoning questions. We are now in our last week of Autumn term. The children have worked extremely hard this term. We would like to take this opportunity to thank you for your engagement in your child’s learning and to wish you a very merry Christmas and a happy new year. Topic - Children will finish their topic of Extreme Earth. Reading- Children will be using retrieval skills to answer a variety of questions. Writing- Children will be continuing their narrative based on Nick's mother's story. Maths - For maths, children will continue to develop their confidence in geometry, using a protractor and ruler, measuring angles and lines. Well done to all children who have been using the Pixl times tables app to practice their times tables. Don’t forget that any child who answers 1,000 questions by 18th December will get a prize from Mrs Catchpole! Key Stage 1: 11.00-11.45 a.m.
Don't forget the Christmas fayre is on Wednesday 12th 4-6pm. Topic - In Topic this week, children will be looking at Extreme Earth and the affect of Tsunamis. Writing- Children will be reading more of 'The Song from Somewhere Else' and exploring the character of Nick's mum. Maths - For maths, children will be looking at measuring and drawing angles. This week we will be doing mock SATs with the children. This is important for the children so they get used to sitting tests and, when it comes to the real thing in May, it is second nature to them. It also helps us, as teachers, assess their learning so far and for us to continue to identify where any gaps are. Please help us by making sure your child is in school on time in order for a prompt start. Don't forget we have year 6 breakfast club, open to all year 6 children. This helps children prepare for their day and allows for us to do extra work with the children (reading, times tables, mathematics, etc). On Thursday, there is a follow up assembly on anti-bullying week where we will have a visitor talk to the children. The assembly will focus on types of bullying and the law. Maths- We will be doing revision sessions with the children in preparation for their tests. Topic- Children will be creating some fun tornado art! Reading- Children will continue to practise retrieval questions. Don't forget homework is due in soon. 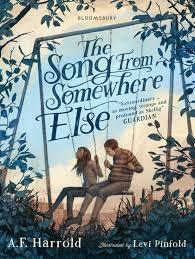 Bullying is the theme of our class novel, ‘The Song from Somewhere Else. Anti-bullying week was 12th-16th November. Pick one of the options below. Friendship box/anti-bullying box. Include: a game you and a friend could play; positive messages; a list of happy things to do; what bullying is; and recommendation on what to do if you are being bullied. Presentation (power point or on paper) on how to be a good friend. Include: what to do if you are being bullied; what you should do if you see bullying take place; how to be a good friend. A letter to an imaginary bully. What would you say to them? What advice would you give them? Topic - In Topic this week, children will be looking at Extreme Earth and where earthquakes take place. Writing- Children will be looking at personification and applying it into their own writing. We will be exploring the link between 'The Song from Somewhere Else' and other books which have similar story lines involving a portal into a different world. Maths - For maths, children will be looking at money and time. They will be answering questions which involve converting minutes to hours and pounds to pence in order to solve a calculation. Children have been exploring this fantastic book, 'The Song from Somewhere Else'. They have been writing character descriptions, poems, letters and asking lots of questions about the story. In preparation for their SATs, the children have also been practising retrieval and inference questions based on the text.